Learn about the New Life Festival. 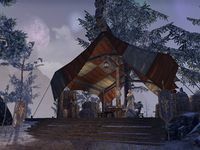 Breda, a New Life Herald in Eastmarch, spoke of the New Life Festival celebrated across Tamriel. Talk to Breda at the tent south of Windhelm. "All are welcome to celebrate the New Life Festival!" I should find Breda in Eastmarch. "You're here for the New Life Festival? I'm happy to serve as a herald. I can tell you all you need to know!" What is the New Life Festival? "It marks a fresh start to the new year, for all who walk beneath the sun. Everyone in Tamriel celebrates! Well, perhaps not the Maormer—but everyone else. You should try it for yourself and see!" I'm interested. Tell me more about it. "The New Life Festival was once a celebration of Magnus, the sun god. I have a book—you're welcome to read about the history, if you care to. But I'd rather tell you about the celebrations. Very few involve a chance of paper cuts!" "Celebrations?" There are more than one? "Of course! They're different all over. I've taken part in cliff jumping, anchor tossing, and even drunken echatere racing ... though Orsinium had to cancel that one. Simply ask, and I'll send you to the best celebrations in Tamriel!" She will then offer a number of repeatable quests to celebrate the New Life Festival with the different cultures of Tamriel. Each quest can be completed once a day. Completing all nine activities unlocks the "New Life Cerulean" dye. In addition, activating Breda's Magnificent Mead Mug memento will net you double XP for two hours. The keg located near Breda can also be drank from, but it does not grant the xp bonus as it in previous years. For completing a subsequent daily quest, you will receive one New Life Festival Box. Each Gift Box contains a guaranteed sample of Wolfsbane Incense, as well as a selection of crafting materials related to the New Life Festival. For a full list of items, see the main page. This page was last modified on 17 December 2018, at 08:06.